One of the things that truly amazes me about DH is her ability to nurture nature. By nature, I'm specifically referring to flora - plants, trees, shrubs, vines, etc. Most folks would probably refer to it as having a "green thumb" or that special ability to make plants grow. But to me, it's a gift. DH has demonstrated this numerous times. She's fond of taking cuttings from plants (mostly flowering) that catches her fancy in gardens of places we visit. And I would jokingly threaten her to stop or else I call the guard in the premises. When we went on a road trip this summer for Visita Iglesia, we had lunch in a place called Cafe Casa Rap in San Jose Batangas. In that place's garden, most of us in the road trip were simply awed by these flowers. Here's a picture of the flower from Wikipedia. 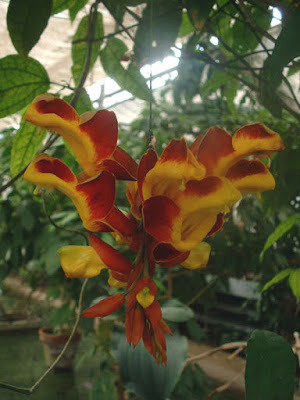 I later found that this plant is called "Thunbergia Mysorensis" although it's also known as "Clock Vine", "Ladies Slippers", "Doll Shoes" and "Brick and Butter" Vine. Fascinated by the flowers, many folks in that road trip asked if there were plants that had these flowers for sale. The owner however did not have any for sale. Well, DH didn't ask. She simply took a cutting from one vine - ehrm, secretly of course. Later, at our last church stop at Caleruega, we again saw these vines in the Caleruega Church gardens. Again, DH simply took a cutting from the vine. The cutting in the black plastic pot with the big leaves on the right was taken from the Caleruega Church while the cutting with the smaller leaves on the left (in the same black pot) were taken from Cafe Casa Rap. Today, I saw DH transfer these 2 cuttings from a tiny pot to this black plastic one and I was dumbfounded! The cuttings' roots were quite robust already! I was impressed. Here's hoping for a couple of healthy flowering clock vines! After a long wait, our Thunbergia mysorensis vine flowered!